As a writer, I’m a notebook junkie, and this week’s Inspire Me Thursday topic happens to be notebooks. The timing is great. I just finished re-arranging my home office and part of the process was collecting up all the notebooks I’ve written in over the years. The stack turned out to be a healthy size – 24, not counting new notebooks waiting for my pen and notebooks I haven’t finished yet. One of them is 20 years old… Can you say “pack rat”? So simple, yet all together they are very artsy too. I do love notebooks. I have a stack myself, although I haven’t written in them recently. I miss it. It is such a good feeling to be organized. Journals are hard to let go of, they are our history. I may go through some of mine and burn some pages though, ha! 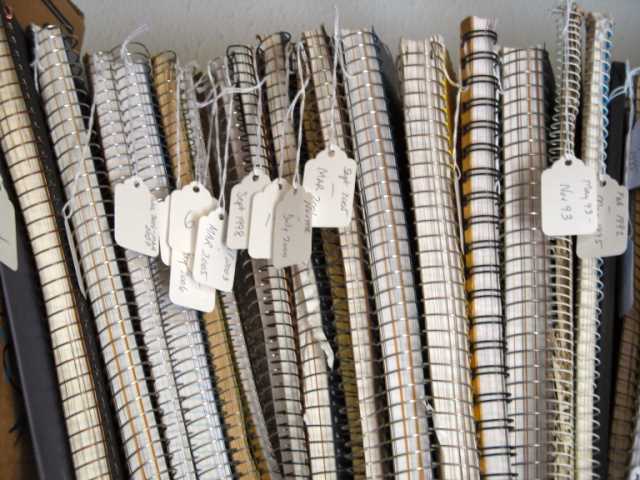 love that photo… there’s just something about a big collection of notebooks like yours that inspires me! Follow this blog: Enter your email address to receive notifications of new posts by email.